CAGAYAN DE ORO CITY--The Provincial Government of Misamis Oriental gave honor and recognition to the farmers, fisherforks, their families and their partners during the Farm Family Forum held at Grand Caprice, Limketkai, Cagayan de Oro City. 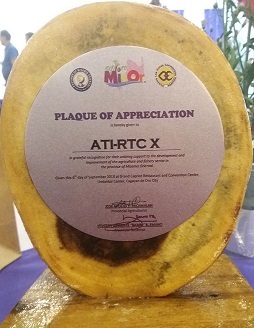 ATI-RTC X, one of the awardees of the event was lauded for being an active partner towards agricultural development of the province. The activity was attended by more than a hundred farmers, fisherfolks, Municipal Agriculturists of the different municipalities of Misamis Oriental and other partners in development. In his message, the newly installed Provincial Agriculturist Mr. Jose Apollo Y. Pacamalan stressed the importance of cooperation among all sectors and government agencies to achieve rice sufficiency in the next three years. Mr. Pacamalan presented the first steps that his office initiated towards achieving the goal. The restructuring of the Provincial Agriculture Office was designed to ensure the marketing of farmers’ produce and the faster delivery of new technologies to the farmers. Aside from the restructuring, Mr. Pacamalan posted a challenge to the municipal governments and the government agencies present in the affair. The goal of achieving rice sufficiency will be achieved if the municipal governments would allocate at least 1000 hectares each of alienable and disposable lands and convert it into upland rice production. With the help of ATI through its training programs, the DA Regional Office and other government agencies for support services, there is no reason that the goal of rice sufficiency in three-year time span will not be achieved. Among the awardees were the two accredited Learning Sites of ATI, the Buhian Diversified Farm represented by Hon. Nemia Penita Buhian herself, and Kape Maramag represented by its President, Imelda P. Mendoza.